The Beauty Clinic offers combined PRP and Mesotherapy treatments for Hair restoration. These treatments are delivered by injections in the scalp that stimulate the bulb cells at the base of each individual hair and improve microcirculation in the surrounding area. The Vitality, Colour and Brightness of the hair is enhanced! The Hair Loss is slowed! The Hair Growth is activated! The use of platelet rich plasma in aesthetic medicine is one of the fastest growing tools in cosmetic and dermatologic treatments. There have been several studies in the last few years documenting the benefits of PRP treatments in promoting healing and regeneration. One of the best indications for PRP treatments is to prevent hair loss and stimulate scalp hair regrowth, therefore delaying the need for surgery in patients with alopecia. PRP is also effective in improving the outcome for patients that have had hair transplant. What is PRP and why use PRP for hair restoration? PRP is extracted from patients own blood by isolating the platelets from the rest of the blood components. Once isolated, the PRP is injected in the scalp by intra-dermal or subcutaneous injections where the platelets release important growth factors (PDGF, VEGF, etc) that stimulate the hair healing and repair. When a hair follicle has become miniaturized beyond recognition, it still has the potential for retransformation and generating larger hair shafts. 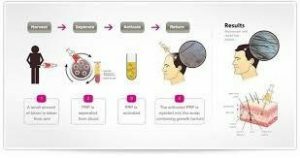 PRP works by reversing the death and regenerating the scalp miniaturised hairs. What are the effects of PRP in hair re-growth treatments? Only patients with moderate androgenic alopecia will benefit from PRP treatments. This is men with Norwood stage 1-3 alopecia and women with Ludwig stage 1-2. Patients must have preliminary tests to ensure that they have adequate number of platelets, normal blood count and do not have other deficiencies that may cause or contribute to the hair loss. Should any imbalances be detected, it is imperative that they are corrected concomitantly with the PRP treatment. Isolating PRP with a platelet concentration of 3-5 times the baseline value. While there are several kits on the market, it is important to avoid concentration under 3 fold or above 5 fold which are less effective. Who is suitable for PRP Hair Restoration treatments? See Patient selection? What is our Hair Restoration protocol? Are there any contraindications to PRP hair restoration treatment? There is no downtime and patients can resume daily activities immediately after the treatment. 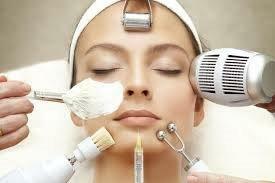 Mesotherapy consists in superficial microinjections of cocktails of nutrients: amino-acids, poly-vitamins and trace minerals in the dermis with the purpose of improving the blood flow and the environment in which the hair grows, thus stimulating the hair’s natural regeneration and proliferation process. This procedure has gained popularity and shows promising results in women suffering from telogen effluvium. We use specific cocktails that have showed benefits in hair regrowth. At The Beauty Clinic we combine mesotherapy and PRP to treat and prevent hair loss.